This could have been a terrible idea. With the death of his partner and vocalist Aleah Starbridge, Juha Raivio had little choice but to wind up their band Trees Of Eternity after just one album, the critically acclaimed ‘Hour Of The Nightingale’. But as the great Sean Harris once sang, “born of sorrow, my cunning revived me” and at some point the multi-instrumentalist went through Starbridge’s notes, pulling out her poems and lyrics and, inspired by what he found, began writing a collection of songs with which to present them. A couple of phone calls later Raivio had a band, with Amorphis’s Tomi Joutsen behind the mic stand and former HIM drummer Gas Lipstick ensconced at the back – Raivio handling guitar, bass and keyboard duties himself – and an album ‘No Stars Upon The Bridge’. 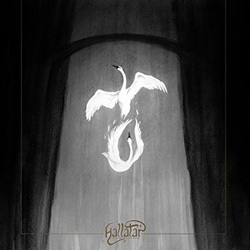 Such is the story of Hallatar, and a debut whose title needs no explanation. But forming the band was the easy bit. A project such as this requires a huge leap of faith. Not only has Raivio had to openly bare his soul at probably the worst time of his life, but of course the album has to stand the test of time, not only as a testament to his partner but also as a collection of music in its own right. And does it? Most emphatically, yes. ‘No Stars Upon The Bridge’ is an engaging and challenging album, devoid of mawkish sentimentality yet imbued with a sense of urgency and longing. Given that sorrow that birthed it it’s naturally an elegiac, yet relentlessly transcendent, offering, with songs that unravel unhurriedly in a dark, funereal gothic fashion. As a point of comparison, Hallatar approach things from the direction of, say, Draconian, and indeed their vocalist Heike Langhans guests on ‘My Mistake’, one of the album’s many highlights. Although on face value there’s little joy to be heard within the material, as the album unveils its secrets it’s apparent that ‘No Stars Upon The Bridge’ keeps its faith buried deep within. Majestic and existential, it could be either a lament for a soul in torment, or a hymn to the wonders of life. Which of these it might be is up to the listener to decide.